Paper and Twine Crafty Design, LLC: Bling up yr scraggily headbands!!! My friend Debbie posted this tutorial on her site. It was a very EASY way to salvage and "bling up" those girly headbands that are starting to look a tad scraggily around our house. Find some scrap fabric with sparkles or some funky textures on it, grab a glue gun and scissors and wah-lah! ;-) If you don't have scrap fabric with sparkles on it, you can always glue gems on! 1. Cut the fabric to the length and width that you need + 1" to fold under the ends. 2. Glue the fabric edge to the inside of the headband just off center. 3. 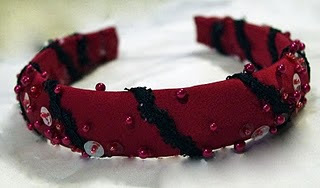 Glue as you fold/wrap the fabric around the headband pulling it tight and smooth as you go. 4. Over lap the beginning edge slightly so that this raw edge is in the center of the inside of the headband. 5. Fold the fabric ends inside and glue. 6. Wrap trim around the head band at an angle from one end to the other securing periodically with glue.